ISLAMABAD — The Taliban has dismissed concerns its recent battlefield gains in western Afghanistan threaten security of a multibillion-dollar gas pipeline being laid through the area to link Central and South Asia. The project, known as TAPI, is planned to move natural gas from the world’s fourth-largest reserves in Turkmenistan through Afghanistan to the growing economies of Pakistan and India. The pipeline is to pass through several Afghan provinces, including western Farah on the Iranian border. Earlier this week, Taliban insurgents assaulted the provincial capital, also named Farah, and almost came close to overrunning it. U.S. air power assisted Afghan security forces to force the rebels out of the city, though fighting is still raging in surrounding districts. Taliban spokesman Zabihullah Mujahid told VOA Saturday his group has already pledged to cooperate to protect the TAPI pipeline, noting that it is a “national project” that will ultimately benefit the Afghan people. “We have an idea of places in Farah through which the pipeline is to pass and we will always try to keep the fighting from those areas,” Mujahid asserted. But the planned TAPI pipeline, he added, cannot deter the Taliban from undertaking operations against “enemy forces” in the rest of the province. Mujahid noted that the gas pipeline is still under construction in the neighboring Herat province and has yet to enter Farah. “As and when the pipeline arrives in Farah, we will ensure from our side, peace and stability in areas around it,” the insurgent spokesman vowed. On Saturday, top Afghan security officials, accompanied by U.S. commander of NATO’s Resolute Support mission in Afghanistan General John Nicholson, traveled to Farah to look into the circumstances that enabled insurgents to enter the city. Angry elected provincial representatives and politicians at the meeting severely criticized authorities for not putting in place effective security measures to prevent the Taliban from assaulting Farah. They cited leadership and other problems among both provincial civilian and security institutions for initial insurgent advances and insisted that without U.S. support, Afghan forces could not have pushed the Taliban out of Farah. Nicholson, while addressing the meeting, reiterated international support for the country and called for replacing Afghan security officials who did not perform well in defending the city. “Farah did not fall and Farah will never fall. … We in the international community want to see a peaceful end to this conflict. But until that time we will stay with you and, if necessary, fight alongside you, until we achieve that peace,” Nicholson vowed. Afghan officials and others meeting in Farah on Saturday again accused neighboring Iran of supporting the Taliban militarily. Nicholson backed those assertions. “I wish that today my message was only to wish you a happy and blessed Ramadan with your families. 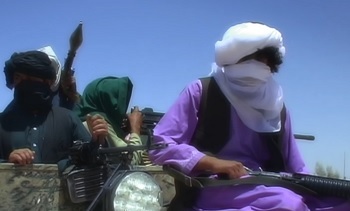 But, unfortunately, the enemies, the Taliban, supported by some neighbors, have elected to attack you here in Farah in the [Muslim] holy month of Ramadan,” he said. In February, leaders of the countries participating in the TAPI project traveled to Herat, which also borders Iran, and jointly inaugurated construction work on the Afghan section of the nearly 1,800-kilometer pipeline. The landmark event rekindles hope for regional peace and cooperation. The Taliban, at the time, also pledged to ensure security for the project. Officials say the project, estimated to cost up to $10 billion, will carry 33 billion cubic meters of natural gas annually for 30 years and is extendable. TAPI was originally conceived in the 1990s, but differences over terms and conditions, unending Afghan hostilities, and rivalry between Pakistan and India hampered implementation of the project. And, their alliances; or, it all new creations, as parallel Anglo/US military strategy, to diffuse and confuse the real Islamic movements of Afghanistan- right in the midst. The pipeline profits are assumed to pay for imposed war affairs in Afghanistan- Now, with the gasoline deal, Turkmenistan gas sales will pay for some good chunk of the Anglo/US military expenditure. THEN, THAT WAY; THE “POWERFUL” US MIDDLE CLASS WON’T HAVE TO PAY ALL THAT HIGH MILITARY EXPENSES EITHER FROM, ALREADY INTOLERABLE GAS PRICE HIKES IN THE US. The US middle class is extremely powerful- if they are pushed too far, they could abruptly stop the genocidal warfares in Afghanistan. THAT IS A HUGE DILEMMA FOR THE ANGLO/US WAR PLANNERS, CRIMINALS AND PROFITEERS. They are walking through an extremely fine line; internally and externally. wait long enough in a protracting it, then it might increasingly turn dreadfull and nightmarish. So, it is better to leave it as amiable as possible before it is too late; at least at the people to people level.